9.14.1 MYTH: There is no official count of the national popular vote. 9.14.2 MYTH: A single state could frustrate the National Popular Vote compact by keeping its election returns secret. 9.14.3 MYTH: Absentee ballots are not counted in California when the number of absentee ballots is significantly less than the amount by which the Democratic presidential candidate is leading. It is sometimes asserted that there is no official national count of the national popular vote for President and, therefore, the National Popular Vote compact would be impossible to implement. The answer is the same under both the current system and under the National Popular Vote compact. 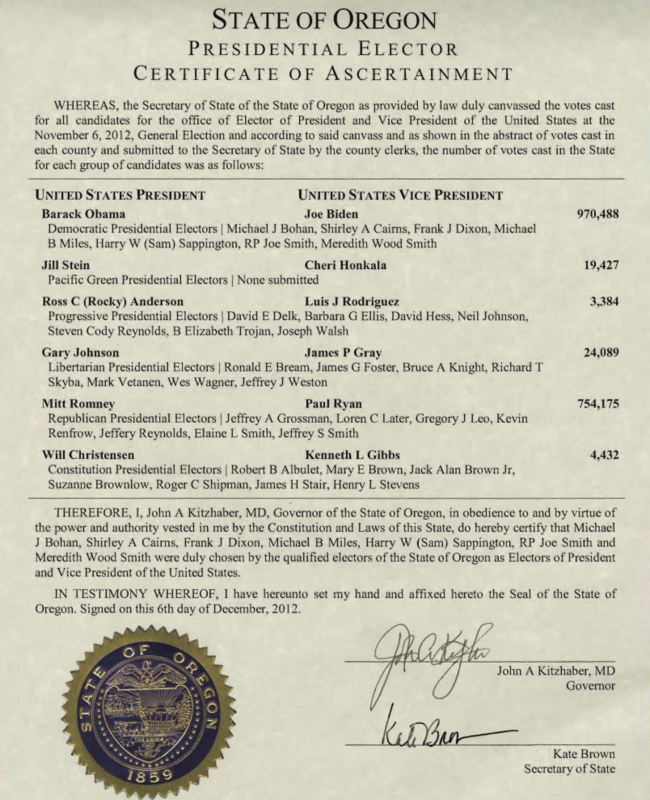 Figure 9.5 shows the Certificate of Ascertainment from Oregon for the 2012 presidential election. Appendices E, F, G, H, and I show the 2004 Certificate of Ascertainments for Minnesota, Maine, Nebraska, New York, and Mississippi, respectively. The certificates of ascertainment from all 50 states and the District of Columbia are available on-line for the 2000, 2004, 2008, and 2012 presidential elections. The national popular vote total for each presidential candidate can be obtained by adding together the popular vote counts from the Certificates of Ascertainment from all 50 states and the District of Columbia. Why does Ross think that the National Archives and Records Administration is “pretending” when it presents a spreadsheet showing the number of popular votes cast for each presidential candidate as certified by each state’s Certificate of Ascertainment? Of course, the vote counts recorded on the states’ Certificates of Ascertainment are used under the current system to award electoral votes. Moreover, these vote counts are considered “official” enough and “accurate” enough to elect the President of the United States under the current system. Current federal law provides for an official public count of the popular vote for President in each state. Existing federal law (section 6 of Title 3 of the United States Code) requires each state to certify the number of popular votes cast for each presidential elector in a public document, called a “Certificate of Ascertainment,” prior to the mid-December meeting of the Electoral College. Figure 9.5 shows Oregon’s 2012 Certificate of Ascertainment. Appendices E, F, G, H, and I show the Certificates of Ascertainment from Minnesota, Maine, Nebraska, New York, and Mississippi. Figure 6.1 shows Vermont’s 2008 Certificate of Ascertainment. The certificates of ascertainment from all 50 states and the District of Columbia are available on-line for the 2000, 2004, and 2008 elections. Professor Norman R. Williams of Willamette University dismisses the federal law by suggesting that presidential elections could nonetheless be conducted in secret. Professor Williams’ proposal for secret elections, secret judicial hearings, and non-disclosure agreements assumes that there is a state in which the voters have such a strong attachment to the current winner-take-all rule that they would be willing to abandon the long-standing tradition of having elections closely monitored by the media, civic groups, and challengers and observers representing the parties, candidates, and ballot propositions that happen to be on the ballot at the same time as the presidential election. Professor Williams’ proposal for conducting secret elections is a parlor game devoid of any connection to real-world political reality. It is simply an urban legend that absentee ballots are not counted in California (or any other state) when the number of absentee ballots is significantly less than the amount by which the Democratic presidential candidate is leading. A typical ballot in California contains votes for between 50 and 100 individual candidates and ballot propositions. Regardless of whether there is any doubt as to which presidential candidate received the most popular votes in California, 100% of the ballots must be counted in order to determine the outcome of the numerous other offices and propositions on the ballot. There were 10,965,856 votes cast in California in the November 2000 election. Although no group of 1,000,000 absentee ballots could have eliminated Al Gore’s 1,293,774-vote lead over George W. Bush in the presidential race in California, these same 1,000,000 ballots determined the outcome of numerous other races on the ballot in November 2000. Regardless of whether there is any doubt as to which presidential candidate received the most popular votes in California, 100% of the ballots must be counted in order to determine the outcome of the numerous other offices and propositions on the ballot. This urban legend is absurd on its face. For the 2012 presidential election, see http://www.archives.gov/federal-register/electoral-college/2004/certificates_of_ascertainment.html. The web address is the similar for 2000, 2004, and 2008. For the 2012 presidential election, see http://www.archives.gov/federal-register/electoral-college/2012/popular-vote.html. The web address is the similar for 2000, 2004, and 2008. Weeks, Luther. Lawmakers seek to change presidential elections to make them more risky, reduce confidence. February 3, 2011. http://ctvoterscount.org/lawmakers-seek-to-change-presidential-elections-to-make-them-more-risky-reduce-confidence/. In order to promote free-flowing debate of speculative ideas, the blog involved does not permit attribution. Williams, Norman R. Reforming the Electoral College: Federalism, majoritarianism, and the perils of subconstitutional change. 100 Georgetown Law Journal 173. November 2011. Page 213. As for public attachment to the winner-take-all rule, the political reality is that the public is not attached to the winner-take-all rule. Public opinion surveys show high levels of public support for a national popular vote for President in every state for which state-level polls are available, including battleground states, small states, Southern states, border states, and other states (as itemized in section 9.24.1). Numerous polls are available on National Popular Vote’s web site at http://www.nationalpopularvote.com/polls. Blog posting by Southerner01. Real Clear Politics. October 12, 2012. http://www.realclearpolitics.com/articles/2012/10/12/how_likely_is_an_electoral_votepopular_vote_split_115749-comments.html.